Wrightstyle has finished a major renovation project for Network Rail Wales at Cardiff Central Station. The completion follows a similar project at Cardiff Queen Street station, in a major programme that Network Rail describes as the largest-ever rail enhancement scheme in Wales. 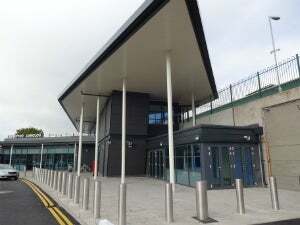 The overall project, undertaken with BAM Construction, is part of the Cardiff Stations Enhancement Scheme, and saw Wrightstyle supply some 300m² of Schueco’s FW60XR enhanced curtain wall system, along with doors, windows, and automated sliding entrance doors. Cardiff Central Station currently handles 13 million passengers a year, but by 2043 this is projected to reach 32 million, a rise of 144%. The £220 million Welsh project, which had to be finished before the Rugby World Cup, has improved station entrances, added new platforms, upgraded track and signalling. The project aimed to increase reliability and capacity on the Cardiff and Valleys rail network. Bam Construction project surveyor Richard Panniers said: "This has been a project of enormous complexity, not least to ensure that all aspects were completed to budget and on time, with both Cardiff Central and Queen Street stations remaining open during upgrading works. "Wrightstyle had to work within those constraints, and the company’s glass and glazing components have helped transform both stations into modern and safe transport hubs," he said. The Cardiff contract further extended Wrightstyle’s commercial relationship with Network Rail for whom it has supplied systems for several stations, most notably for the refurbishment of London’s King’s Cross. Wrightstyle managing director Tim Kempster said: "At Wrightstyle, we have long experience in both rail and airport projects. For example, a major rail hub in Hong Kong and the Dubai Metro and, in the UK, in several railway and underground stations." "Our comprehensive range of advanced doors, internal screens, and external glazing systems are designed to contain fire, smoke and toxic gases for up to two hours, and have been successfully tested against both ballistic and bomb attack."